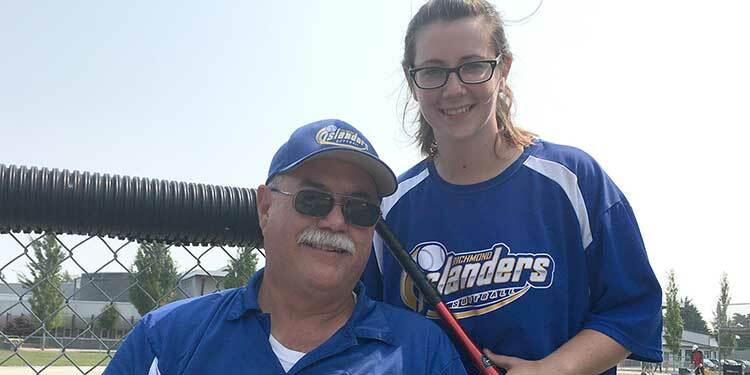 Barry Riva planted a love for baseball that he and his daughter Chelsea continue to cultivate on Richmond's softball diamonds. A self-described sports nut at heart, Barry Riva has passed on his love of the game to his daughter Chelsea. And today they share that affinity as co-coaches of a Richmond Islanders girls’ softball team. It’s a unique extension on the father-daughter relationship, agrees Barry. Through the years, father and daughter have spent considerable time dissecting the game—often on their way home from the ball park. Or chatting over steeped tea at Tim Hortons. But foremost on their minds is that the players are having fun. Coaching together since 2014, soon after Chelsea “aged-out of minor ball,” the pair now feed off each other. Chelsea says the game of softball is as much mental as physical. With every pitch, she enjoys anticipating what will happen next. Of Chelsea, Barry says: “She still plays, and plays well, and the younger girls buy into what she says,” he explains. Captain of her Islander teams, because of that leadership, she is able to step up to whatever the task is. Baseball was Barry’s first love. He picked up his first bat and ball when he was six years old, playing on a team that was coached by his dad. But at the time, an after-game visit to the new McDonald’s in Richmond was equal to the activity itself. “Batting practice was in the backyard with a tennis ball, to save on windows,” Barry laughs. Father and daughter are also both fanatical followers of the Toronto Blue Jays. At any given time, one or both is wearing something Blue Jays. Naturally, when Chelsea began playing t-ball (at the age of five) her dad was the coach and, of course, the team was called the Blue Jays. So it’s only fitting they would later join forces from the sidelines.